There are more shop closures on our High Streets than there are openings, so how can we encourage people to stop checking out of these once thriving centres? Research from the Local Data Company showed that 14 shops closed every day in the first half of this year, in what was actually the lowest level of closures in seven years. Last week, a survey - carried out for BBC Radio 4's You and Yours - found that in 12 government-funded "Portas Pilot" towns, nearly 1,000 shops had disappeared in five years. We asked Mary Portas and other commentators how to make our High Streets fit for purpose in the years to come. It may be better known for its football than its fashion but Blackburn was crowned the "winner of winners" in last year's Great British High Street Awards. Harriet Roberts is a manager for Business Improvement District (BID) Blackburn and she said a lot of her work was about changing perceptions. Much of this has been done through events held in the town centre. Blackburn hasn't settled for the usual Christmas lights switch-on ceremony, but instead planned an art installation complete with aerial performances, as well as a lantern parade and festive 'street feast'. "You market them in a commercial way and target battleground areas," Harriet explained. "We're really ambitious. It gets people into the centre and then they'll come back." The BID invested the award prize money it won into market stalls which can be used for pop-up street fairs throughout the year. "People need to stop using the term High Streets," Harriet Roberts said. "Town centres are a place where people come to learn, for public services, to live and share time. They have to have the whole mix and keep moving." In Blackburn, empty shops have been turned into office spaces or a cocktail bar and the latest research shows that coffee shops, beauty salons and ice cream parlours are increasing in number across the UK. Mary Portas argues this is exactly what should be happening to adapt to how people are living now. "We're spending our money on fitness, eating out and wellbeing," she said. "We should be building the right places and spaces for how people want to live." The decline of the High Street has been charted alongside the continued rise of the online market. But the two need not work against each other. "Online and offline must merge together," said Lyndsay King. Ms King launched Save The High Street in 2016 with Alex Schlagman. The campaign is championing what she calls a "connected digital High Street" and now has a board of more than 300 independent retailers from across the UK. She says all retailers, no matter how small, should be able to offer a basic e-commerce platform so customers can shop in whatever way is convenient for them. "Customers can see what is in store before taking the trip to the High Street or they can choose to order direct from the shop," Ms King said. A host of new apps offer to "digitise shops" by supplying tech platforms for retailers who are not able to build their own. Meanwhile, Amazon, one of the biggest retailers in the world, has started to experiment with bricks and mortar. The online giant has opened physical book shops in the US and earlier this year, it bought organic grocery business, Whole Foods. It has also revealed plans for a food store without check-outs. From ambitious window displays and live DJ slots to selfie booths and a virtual reality water slide, high street retailers are getting more creative in how they lure customers through the door. "We've got to think about more than the transaction and build the experience," said Alex Schlagman of Save the High Street. Apple have gone a step further to declare that their future stores will be 'Town Squares' - billed as a cross between a shop and a community space. "People need that real life experience more than ever and they are actually seeking it out," said Ms King. "A trend we've seen is that businesses are starting to offer multiple things under one roof. A clothing store with a coffee shop, for example." This multi-use approach gives retailers an opportunity to get involved with a local community too. "Host events, workshops and pop-ups. Or host another business's product in your shop," said Ms King. "A vape store may also have a clothing range or host a movie night every week. Use space more efficiently and get a break on your rates. "This is also a great way to get to know your customers." As marketing strives to be more personalised, older retail traditions like knowing your customers by name can have huge value, Mr Schlagman added. "Local council and central government need to decide what type of country we want to live in and intervene to protect social infrastructure," Mary Portas told the BBC. Industry experts have long warned that rising business rates are part of the reason behind the UK's empty shop units. Last month, the British Retail Consortium said further increases expected next year could be "the last straw" for many shops. Business rates are a property tax based on rental values, which increase in line with inflation. The Treasury sometimes changes the rateable value of business properties, in a process known as revaluation. So in effect, the government sets the rates and the councils collect them. 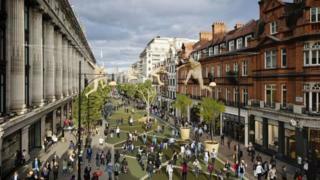 It's the councils, Ms Portas argued, that could make a difference to High Streets. "Simple initiatives like offering business rate discounts for independents and entrepreneurs, refusing Out of Town planning approval, and scrapping parking charges, will go a long way in helping our high streets," Ms Portas added. In March, the government announced £435m in support to firms facing the steepest increases in bills following the latest revaluation.